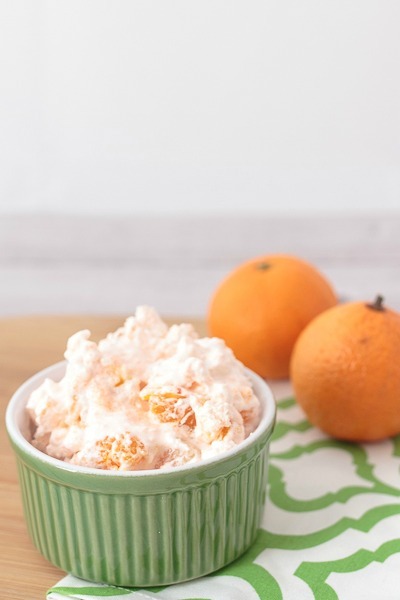 Planning a summertime bash? 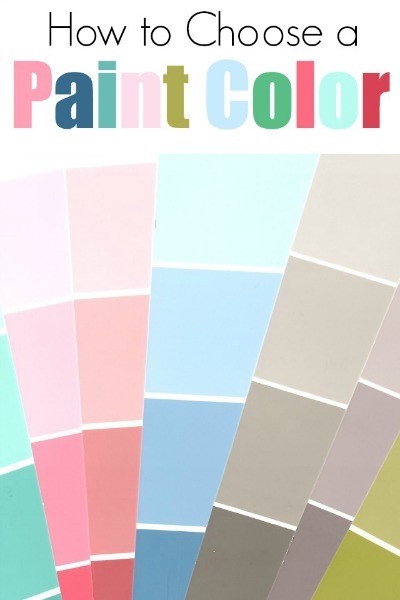 Break out the bright colors, tropical and coastal-inspired motifs and flamingo party supplies for a fun, casual vibe. Some 20 years ago when I was a newspaper reporter, I got invited to a progressive dinner party as part of a story I was writing. It was so much fun, journeying from one house to the next for each course of the meal. I’ve wanted to host a progressive dinner ever since. I know technically this is supposed to be a backyard bash. And even though our back porch and patio are lovely for entertaining, I decided to move things inside since it’s been so hot and humid here in North Carolina. Actually, I totally messed up on the theme of this month’s progressive dinner. By the time I realized my mistake, it was too late to set things up outside and take new photos. So, I decided to just roll with it — as you have to do when you’re hosting and things don’t go as planned. Like the time our grill ran out of propane halfway through cooking a chicken for a dinner party. But that’s a story for another day! Because I know my co-hosts are gracious — as are you, my guests — we’re still going to have fun at this indoor-outdoor party. 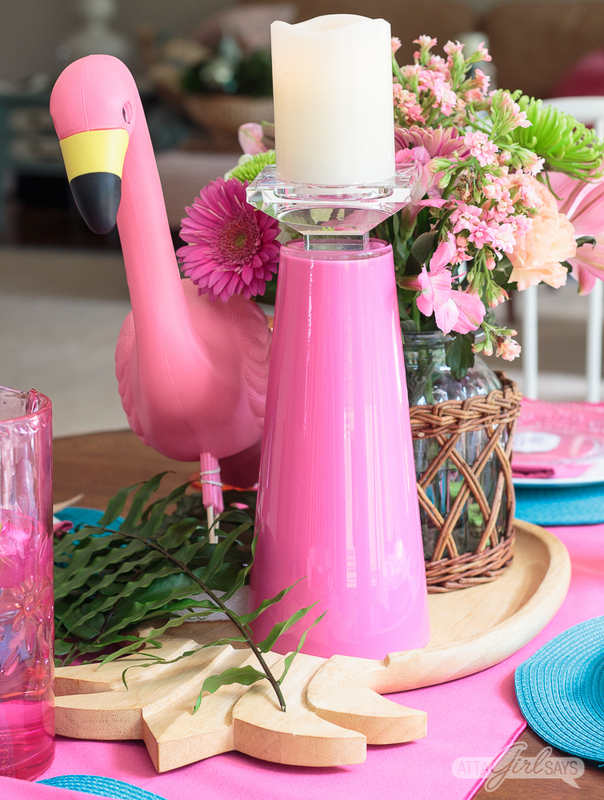 I pulled out my brightest linens and some flamingo party supplies to create a colorful, casual summer tablescape. 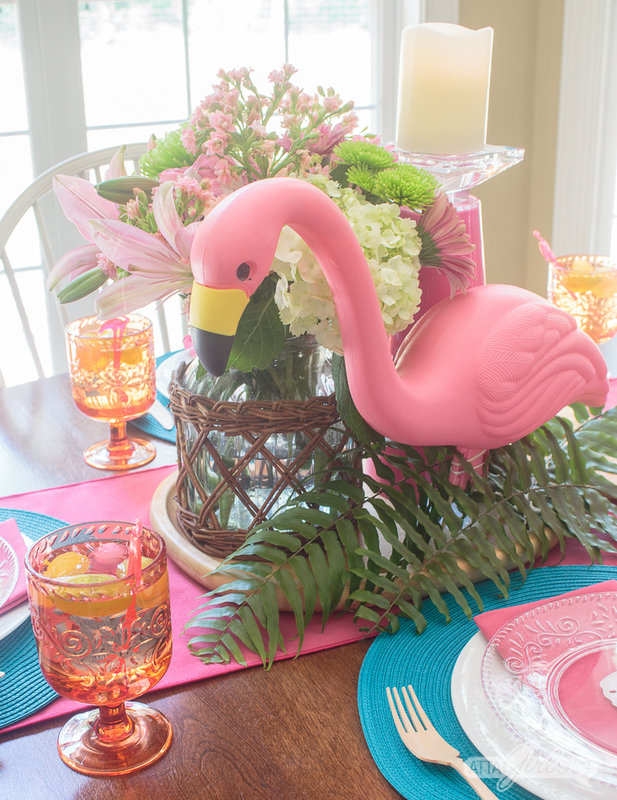 Nothing says summer quite like a pink flamingo party! 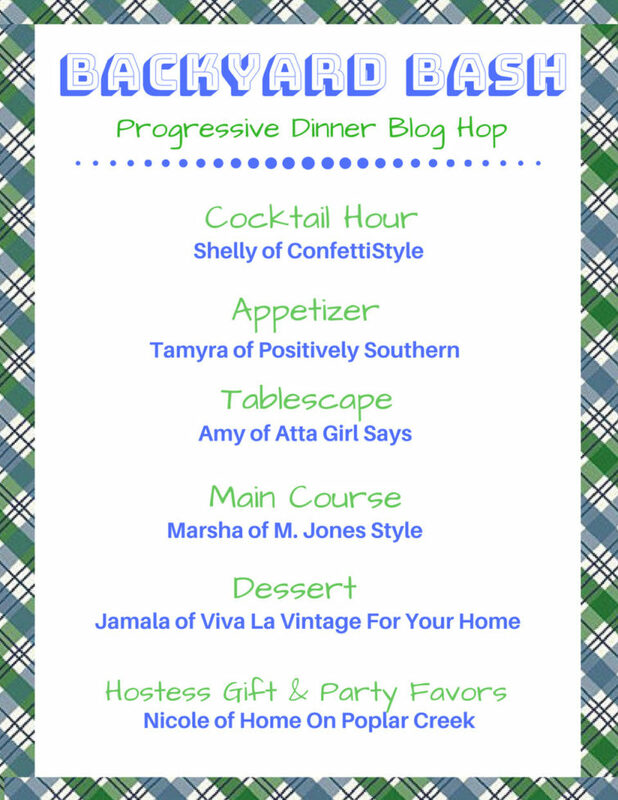 This month’s Sand Dollar Lane Box theme was “Dining Al Fresco” — perfect for our progressive dinner party. 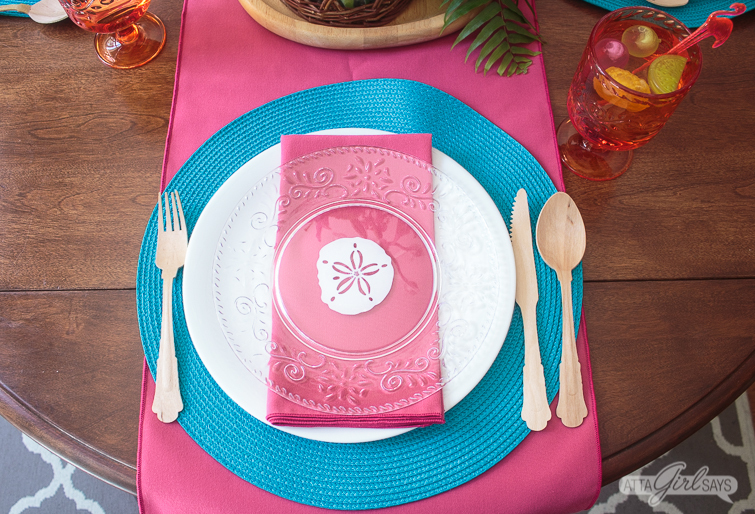 I used the Sand Dollar Lane salad plates and blue round placemats from the box with some white dishes, hot pink table linens and wooden utensils. 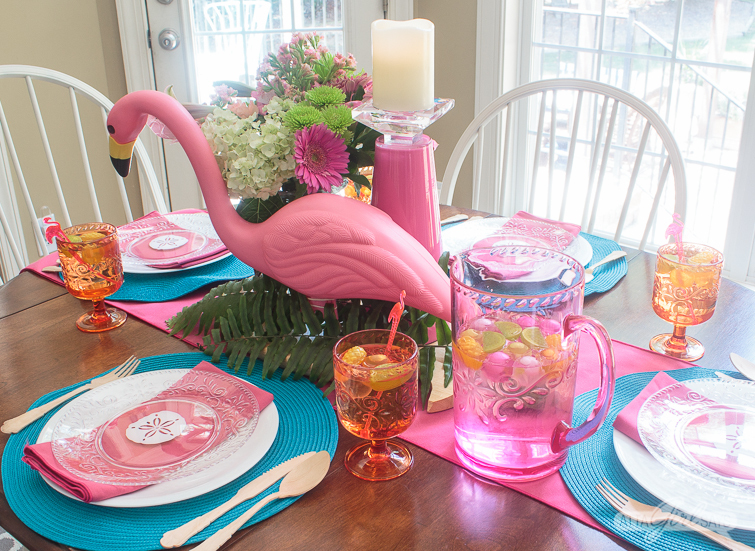 The colorful table linens and melamine pieces inspired me to go all out with flamingo party decor. 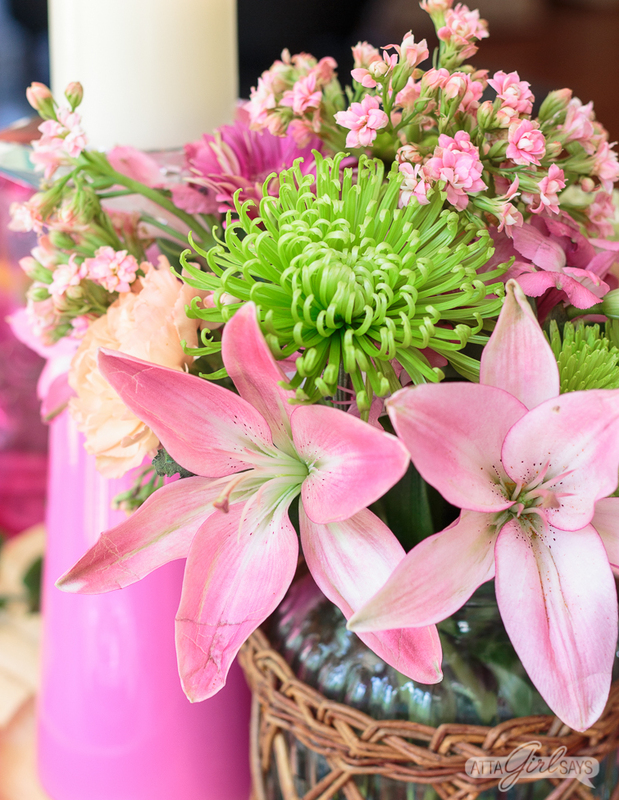 I incorporated a pink lawn flamingo into the centerpiece, along with some pink, orange and green grocery store flowers. The entire centerpiece is sitting on a wooden pineapple cutting board. It turns out I have a lot of flamingo party supplies, probably from all those Target Dollar Spot impulse buys! 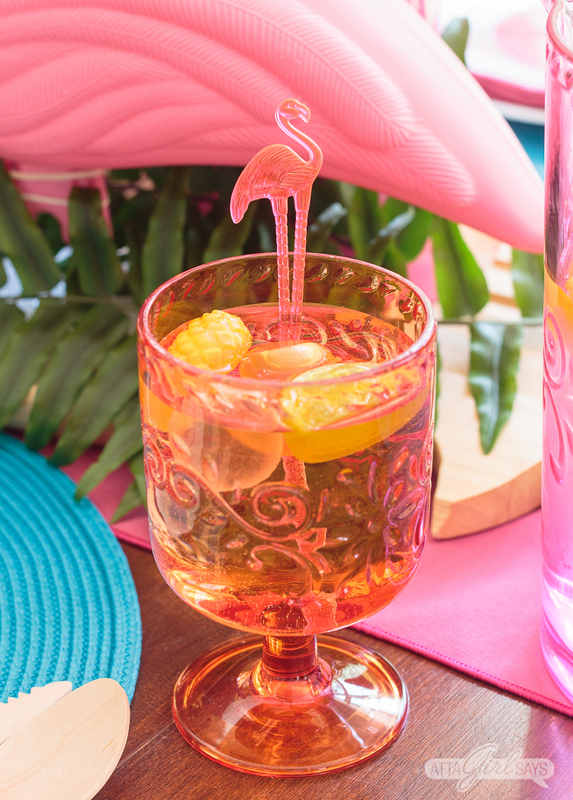 Flamingo swizzle sticks and reusable fruit-shaped ice cubes are perfect for a summertime cocktail! If you’re wondering what to serve at a pink flamingo party, I have a few suggestions. 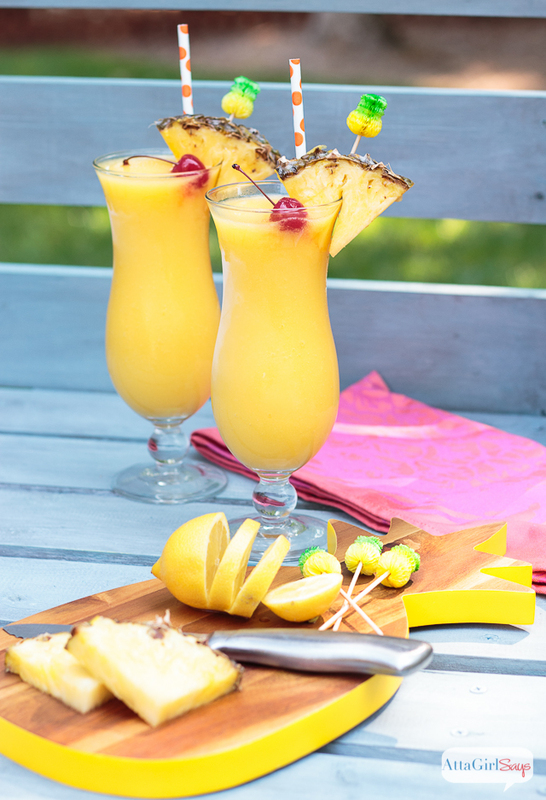 Spiked tropical pineapple mango frozen lemonade fits the theme and the flamingo party color scheme. 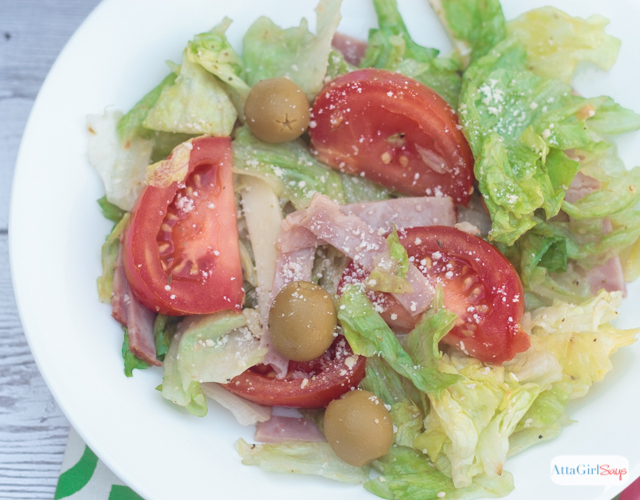 This 1905 Salad is seriously the best salad ever — and you won’t have to turn on the oven to prepare it! 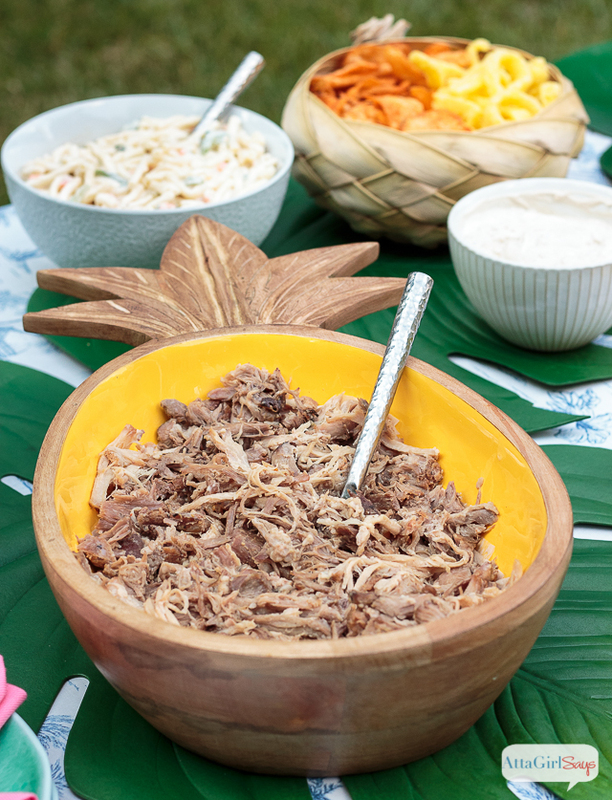 If you feel like cooking, slow-roasted Kalua-style Hawaiian pork is a delicious and easy option. 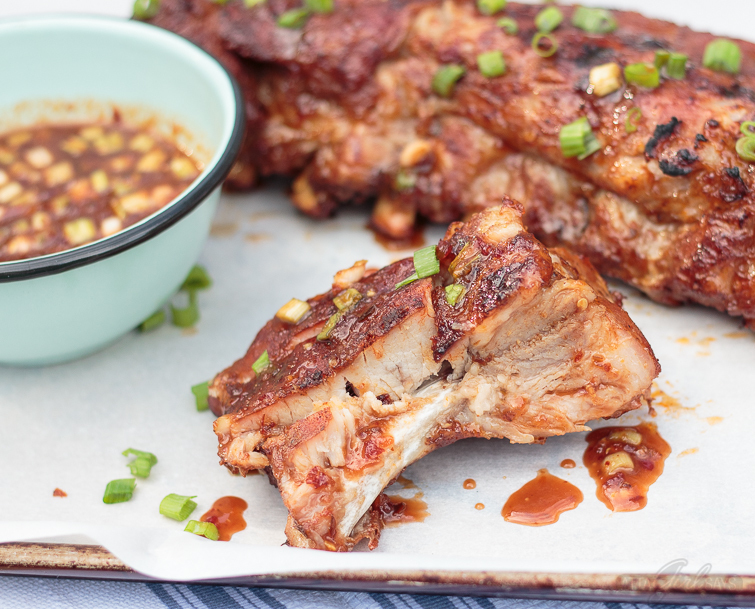 Or fire up the grill and make these glazed Asian sweet & spicy grilled baby back ribs. 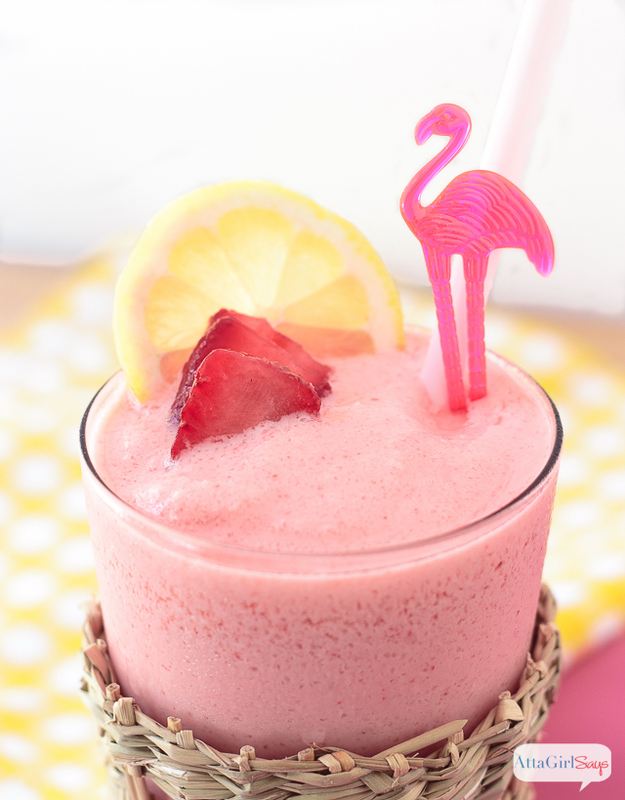 Frozen strawberry lemonade is a refreshing treat for dessert. 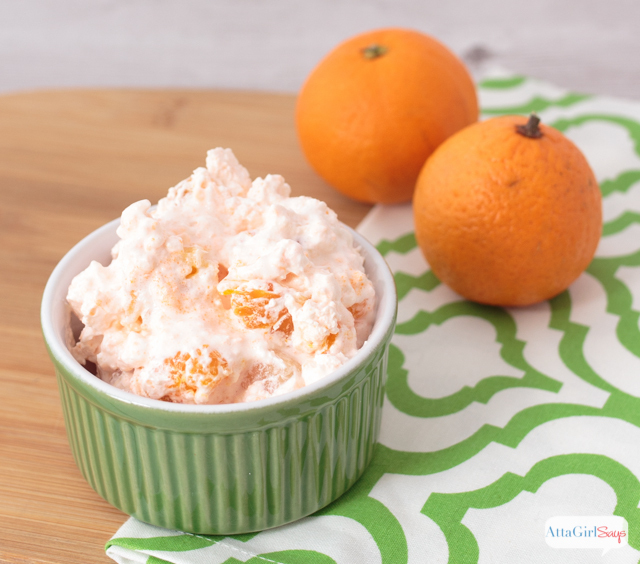 JELL-O Mandarin Orange Salad is another great option, if you’re looking for something lighter. 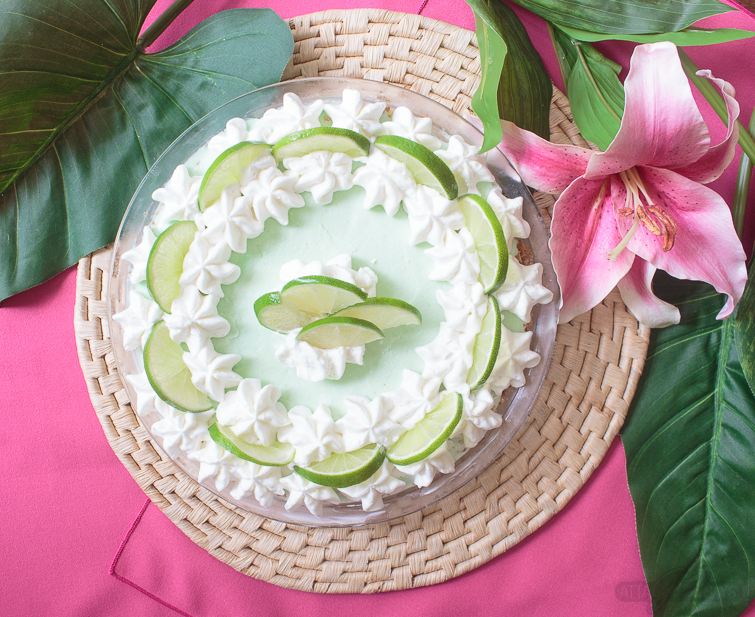 Frozen margarita ice cream pie is a boozy, decadent treat. All this talk of food is making me hungry. 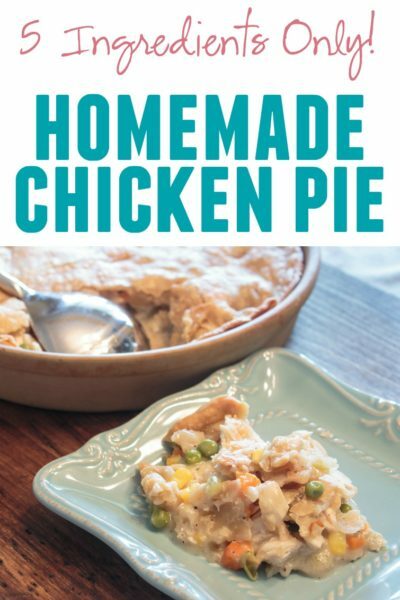 Let’s head over to M. Jones Style to see what Marsha is dishing up for dinner. Don’t forget to sign up to receive the Sand Dollar Lane subscription box to get coastal farmhouse decor delivered to your door every month. 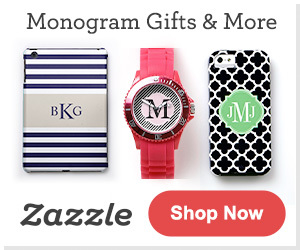 You can save 10 percent at checkout when you use the code attagirl10. What a lovely table you set! I am following the whole progressive backyard bash! Thanks for bringing it in… the heat would have made us all melt. 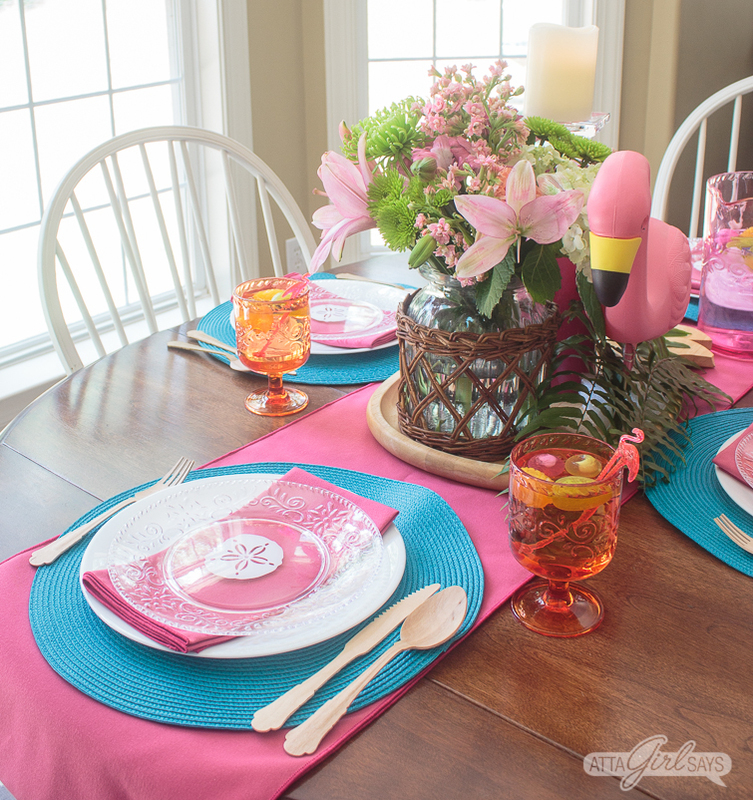 The Pink Flamingo table setting is perfect! Thank you, Nancy! And you’re right, we would have totally melted. The humidity has been so bad lately — much better to party inside! What a cute summer tablescape you created Amy. You definitely put us all in the mood for a summer party. What a gorgeous tablescape! 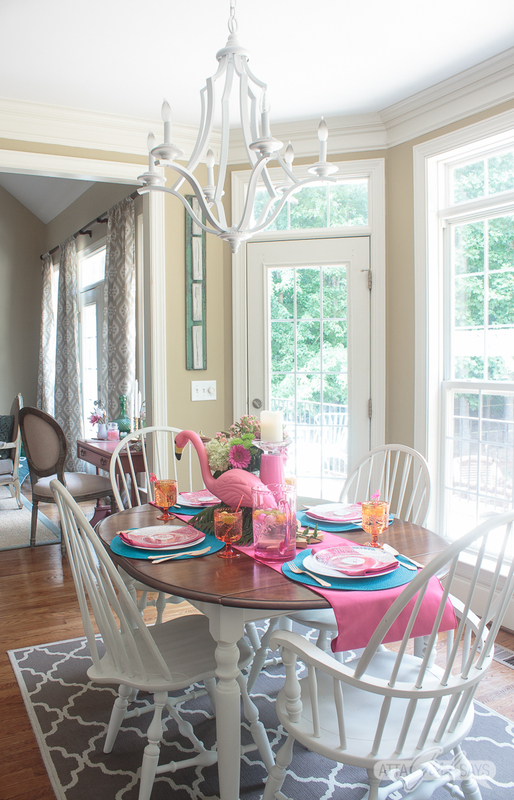 I love all the bright beachy colors and if course the flamingos!! Thanks! Now I’m wistful for a beach vacation! Didn’t you know some of the best outdoor parties are inside?! I absolutely adore flamingo everything! So in love with your tablescape!!! Someone’s been flocking lawns in our town and I thought it was the cutest funniest prank.. and now I see this cute tablescape! Nothing says summer fun like pink flamingos.. ..so Florida-ish.. reminds me of being on vacation… smiling and enjoying the table.. I heard some rumblings around our neighborhood that there might be a flocking. I think that would be a hoot! Thanks for stopping by. I’ve enjoyed cohosting with you. Well good for you for “rolling with” what you had! At every outdoor party I have there is ALWAYS someone who hates eating outside. So this works just fine. Nicely done. I’m usually that person! 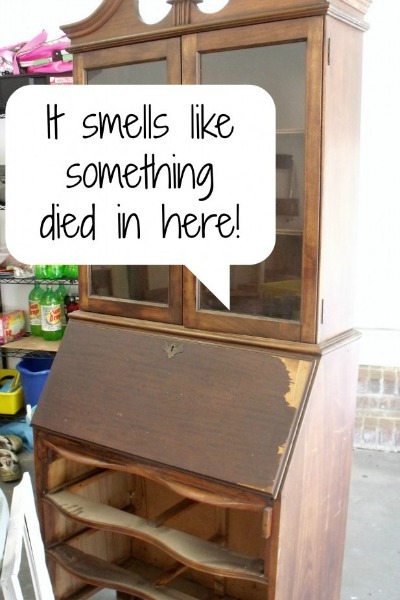 Well, only when it’s hot or muggy or buggy. Amy, shhhhh! No one will even notice as soon as they lay eyes on this gorgeous summertime tablescape. I vote for inside dining here in Texas at 107 degrees. Love all the colors. Progressive dinner parties are so fun but haven’t done those in years. Gotta bring those back! Your post is timely. My SIL’s and I are doing a tablescape for a church event, and we just decided on a flamingo theme this week. (Hope no one sees this!) 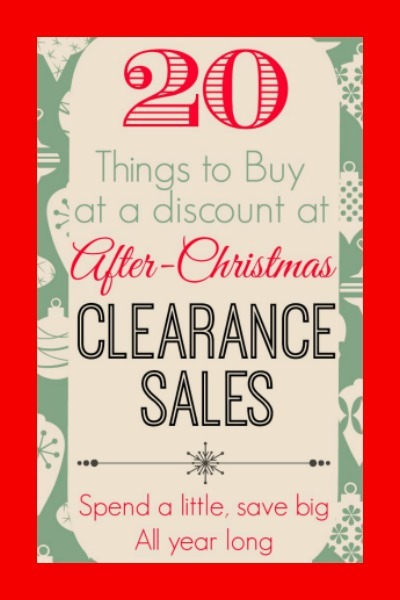 I will be ordering some flamingos from Amazon so I’ll use your link!